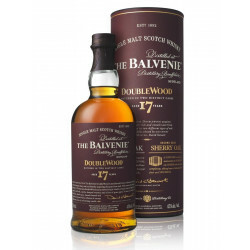 Balvenie New Oak is a combination of various 17 Year-Old Balvenies aged in Bourbon and Sherry casks. Balvenie has been aged in 53 different casks to develop the best aromas. Crafted by David Stewart, Balvenie Double Wood is a combination of various 17 Year-Old Balvenies, aged in American Bourbon barrels and Sherry casks. This Single Malt has then been refined in 53 new oak caks, to develop the best aromas. Rich and smooth, oaky vanilla and spices account for the full-bodied expression, over notes of dried fruits, dark cherries and toasty oak. Nose: oaky vanilla, sweet spices and malted barley, mingled with orchard fruits, black cherry, red berries and dry grass. Palate: thick and tongue-coating, slightly dry with candied fruits (apricots, dates) and a spicy taste sensation over a toasty, oaky body, lifted by dark cherries aromas and coconut. Finish: lingering on the warmth of the oak.